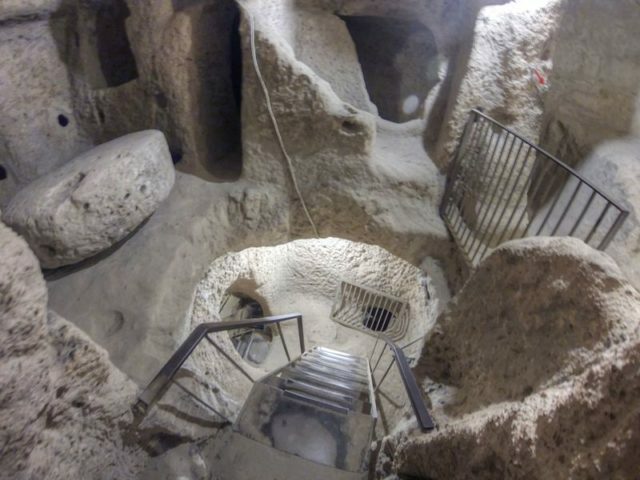 Located deep underground in the Central Anatolia region of Turkey, the underground city of Kaymakli lies hidden and abandoned. 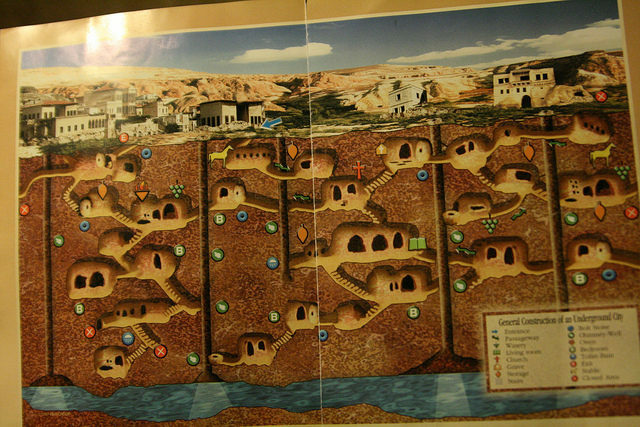 Its ancient name is Enegup, and this city was built for one reason only – to protect the citizens of Cappadocia from attack. 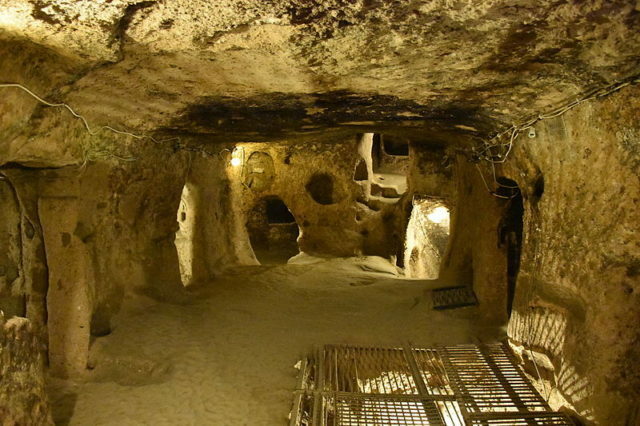 Bearing a strong resemblance to another underground city that goes by the name of Derinkuyu, which was also built by the Phrygians in the 7th century, Enegup is one of the hundred hidden cities of Cappadocia. The houses above are neatly structured and placed so that they conceal the fact that the city has no less than a hundred entrances. 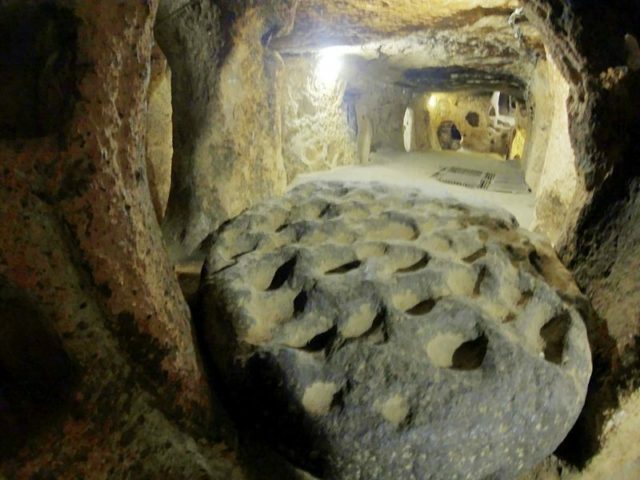 As is often the case with these underground cities, a huge stone boulder stands at the door between the outside world and the safety of the volcanic rock. 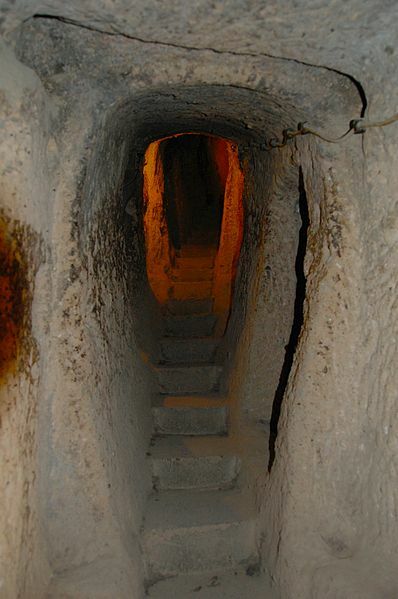 In contrast to Derinkuyu, the tunnels are smaller and narrower and have a somewhat steeper incline. On the four floors opened to tourists, one can’t help but notice that all of the rooms are organized around the ventilation shafts, which makes them vulnerable and dependent on a steady flow of air. One the first floor of Enegup, a small stable can be found. The small size of this stable led archaeologists to believe that there are other stables in the areas still undiscovered. 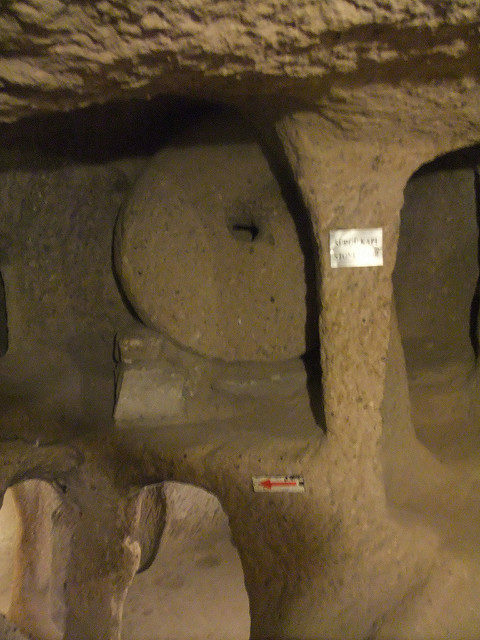 To the left of the stable, one can find the church, and on the right side one can see what is believed to have been the living quarters. In times of need, the church and prayer were the only way to get through the days of war. On the second floor, there is yet another church, this one with a nave and two apses. 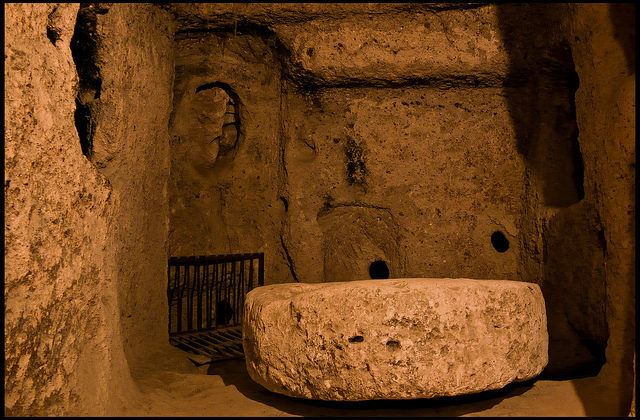 In front of the apses, there is the baptismal font, and on both sides of it are the seating platforms. Some graves were found on this level with names that coincide with those located next to the church, which led archaeologist to believe that the graves are those of religious people. 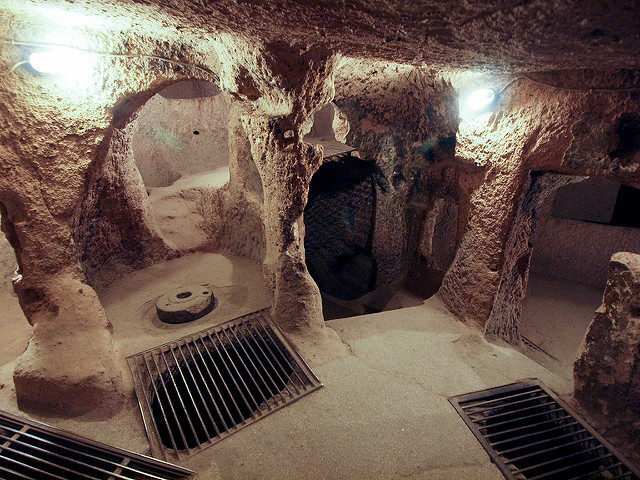 The third floor was the heart of Kaymakli. 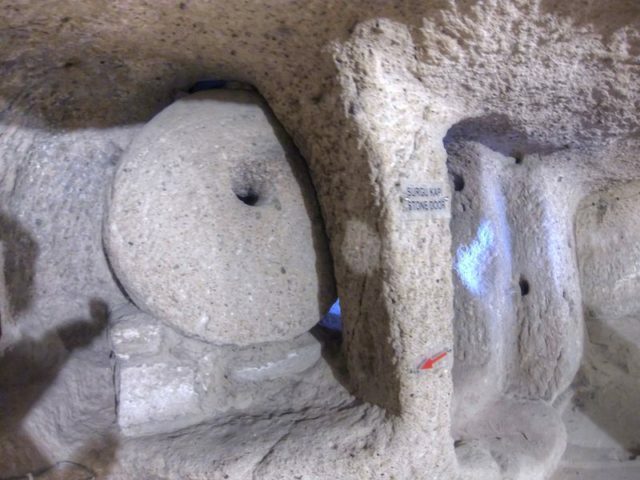 Here are located the storage rooms, wine and oil presses, and the most important part of every settlement, the kitchen. Another interesting discovery was made on this floor. A remarkable block of andesite with relief textures was found, believed to have been used in cold-forming copper. 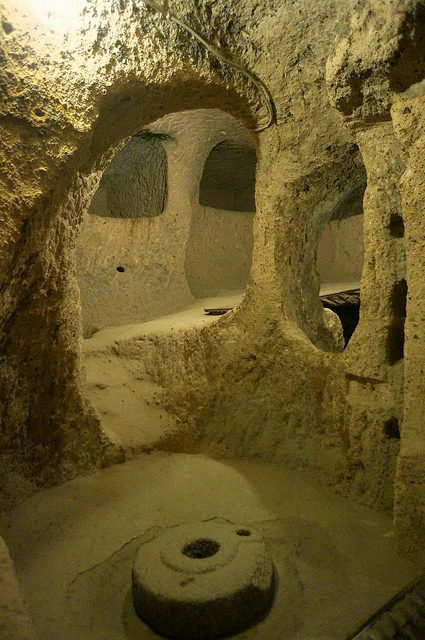 On the fourth floor of this city, a huge number of earthenware jars were located, which proudly speak for the degree of economic stability the citizens of Kaymakli enjoyed. Comparing the number of jars with the number of living quarters indicates that there are a great number of discoveries yet to follow.